This is the second post in a two-part series highlighting how AIOps is changing IT performance optimization. Part 1 explained the basic principles of AIOps. The original text of this series appeared in an article on Information Management. Here we look at the business requirements driving the trend to AIOps. Why do businesses need AIOps? 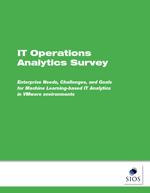 IT pros move more of their business-critical applications into virtualized environments. As a result, finding the root cause of application performance issues is more complicated than ever. IT managers have to find problems in a complex web of VM applications, storage devices, network devices and services. These components that are connected in ways IT can’t always understand. Often, the components a VMware or other virtual environment are interdependent and intertwined. When an IT manager moves a workload or makes a change to one component, they cause problems in several other components without their knowledge. If the components are in different so-called silos (network, infrastructure, application, storage, etc. ), IT pros have even more trouble figuring out the actual cause of the problem. The process of correlating IT performance issues to its root cause is difficult, if not impossible for IT leaders. According to a recent SIOS report, 78 percent of IT professionals are using multiple tools to identify the cause of application performance issues in VMware. For example, they are using tools such as application monitoring, reporting and infrastructure analytics. Often, when faced with an issue, IT assembles a team with representatives from each IT silo or area of expertise. Each team member uses his or her own diagnostic tools and looks at the problem their own silo-specific perspective. Next, the team members compare the results of their individual analyses identify common elements. Frequently, this process is highly manual. They look at changes in infrastructure that show up in several analyses in the same time frame. As a result, IT departments are wasting more and more of their budget on manual work and inaccurate trial-and-error inefficiencies. To solve this problem and reduce wasted time, they are using an AIOPs approach. AIOps applies artificial intelligence (i.e., machine learning, deep learning) to automate problem-solving. The AIOPs trend is an important shift away from traditional threshold-based approaches that measure individual qualities (CPU utilization, latency, etc.) to a more holistic data-driven approach. Therefore, IT managers are using analytics tools to analyze data across the infrastructure silos in real-time. They are using advanced deep learning and machine learning analytics tools that learn the patterns of behavior between interdependent components over time. As a result, they can automatically identify behaviors between components that may indicate a problem. More importantly, they automatically recommend the specific steps to resolve problems. Virtual IT environments are creating an enormous volume of data and an unprecedented level of complexity. As a result, IT managers cannot manage these environments effectively with traditional, manual methods. Over the next few years, the IT profession will rapidly move from the traditional computer science approach to a modern “data science” AIOPs approach. For IT teams, this means embracing machine learning-based analytics solutions, and understanding how to use it to solve problems efficiently and effectively. Finally, executives need to work with their IT departments to identify to right AIOps platform for their business.